The video translates from Russian to English and says “A strange creature got into the camera lens of a driver near Severodvinsk. 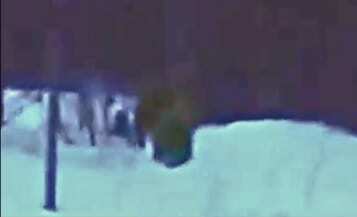 The man who shared the video on the web, said that he accidentally noticed how along the highway a mysterious creature moves, completely covered either with fur or with hair. Thanks for this, Wes & Bigfoot Tony. Very interesting. Theres a sign that the object in focus passes in the back of. So its obviously an area that has some people traffic. The figure doesnt (to me at least) look to be too out of range of a human. However, the object looks to be rather bulky/ or robust. Possibly even overweight? . Nor does it seem to be alarmed at the fact that a car is passed, or that humans ran up to it. It is interesting though. Right around the 7 -minute mark, when he’s showimg that step repeatedly, the knee of its right leg (the back leg) never completely straightens, and the left foot, moving forward, seems to do that little turn-out at the heel as it swings around in front, and the toes seem to be beginning to point downward for the next step, the gait Patty made famous. That would be hard to fake walking at that speed in knee-deep snow. The way the upper body is moving also seems compatible with a BF gait, as if it’s using its shoulders and torso to help swing each leg through a slight arc through the snow. Could be real.